To cut a long story short, Jacob Collier’s début album, In My Room, has the makings of greatness, but it tries so hard to achieve something hugely impressive that, on fairly frequent occasions, songs feel overstuffed and overly ambitious. This is NOT to say that In My Room is, by any means, a bad record; on the contrary, this is one of the more interesting and original jazz(ish) records I’ve heard this year, and it’s a joyful listen from start to finish, but I can’t help thinking that Collier doesn’t quite do himself justice here. All of the songs are great ideas with intelligent and thoughtful key concepts, but Collier, being a composer, singer, instrumentalist and producer of great ability, seems to be trying to prove himself as such by filling each track with esoteric harmonies and layer upon layer of instrumentation. Conceptually, this works really well, especially on the slower tracks. Collier’s use of reharmonisation, particularly with regards to the multi-track vocals provides a constant sense of motion that is somewhat reminiscent of the piano playing of the late John Taylor (whilst being a whole lot more conspicuous). Collier’s voice is almost angelic in quality, and his delivery is particularly dexterous. Likewise, his instrumental performances (of every instrument heard on the entire record!) are equally impressive; especially his piano and bass playing. Unfortunately, when he packs a song to the brim with different sounds, it’s harder to pick each one out and really appreciate it. I found songs like ‘Saviour’ and ‘Down the Line’ relatively difficult to truly immerse myself in, as despite catchy melodies and powerful grooves, there was some what of an aural overload. This aspect of In My Room was particularly disappointing on the record’s concluding track, ‘Don’t You Know’. Said song was one of my favourites on Snarky Puppy’s immense, collaborative project, Family Dinner Vol. 2. I loved it for its intensity and its complexity, and because despite those aspects, it never felt out of control. The version of ‘Don’t You Know’ on this record loses that sense of restraint. I would contend, that this is largely as a result of Collier’s production. There is an abundance of electronic effects, and the instrumentation is a little too dense. At its core, it is a fantastic song, but the ambition that was poured into this version, was perhaps, too much for the song’s integrity to withstand. In My Room is, despite its occasional slip-ups, littered with gems. I’ve written previously about how fantastic a track the album’s lead single, ‘Hideaway’ is. In addition to this, In My Room features some beautifully serene cuts such as ‘You and I’ as well as what may be my favourite cut on the record, ‘In the Real Early Morning’- it’s certainly the least cluttered. It features Jacob (without multi-tracked vocals), a piano and some very subtle, and etherial, electronic effects. He’s still generously applying reharmonisation to his piano playing here, but it’s far less on the nose than on the rest of the record. His vocals are silky smooth, and his lyrics are comforting and pensive. Every time I listen to this song, I tear up a little. Other excellent tracks include the jubilant ‘Hajanga’, and the quirkily nostalgic ‘Flinstones‘, which features a mindblowingly nimble melodica(!) solo. To be completely honest, if you like any of Jacob Collier’s music, you’re likely to find something you love about this record. For me, In My Room‘s appeal lies in its quieter, more reflective moments, as well as the potential to be found in the livelier ones. This is by no means a perfect record, but it does show what Jacob is capable of doing. My hope is that his next record sees Collier more keen to seek out the input of other musicians and better able to see when a great idea has become warped by heaps of other great ideas. 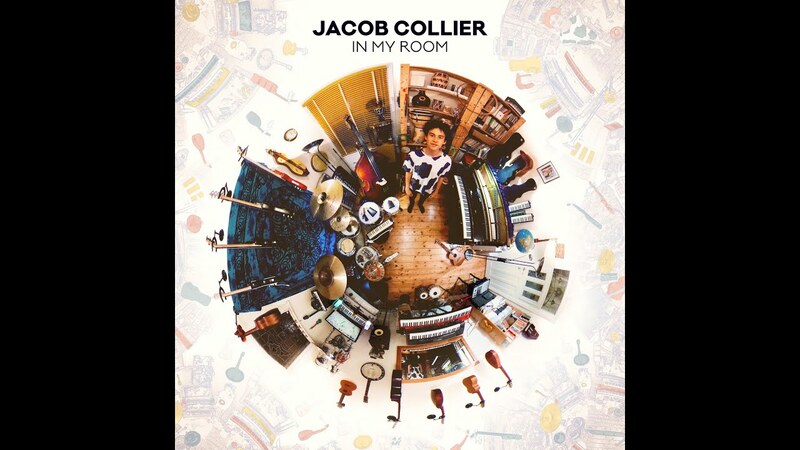 In My Room is, despite its minor flaws, an enjoyable debut that introduces Collier to the world as one of modern music’s latest and greatest innovators.